Miners using a pneumatic drill, Rhondda Valley, South Wales, 25 June 1931. Standard Kilogramme under glass shade, c 1930s. 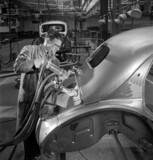 Rivetting a car body, Brixton, 1951. Halliday's 'Standard' self-regulating windmill, 1877. Miners working coal face, Powell Duffryn Colliery, South Wales, June 1931. 'Viaduct at Ivy Bridge, Devon', mid-19th century.